We all know by now how important it is to set our horse up for success in training. 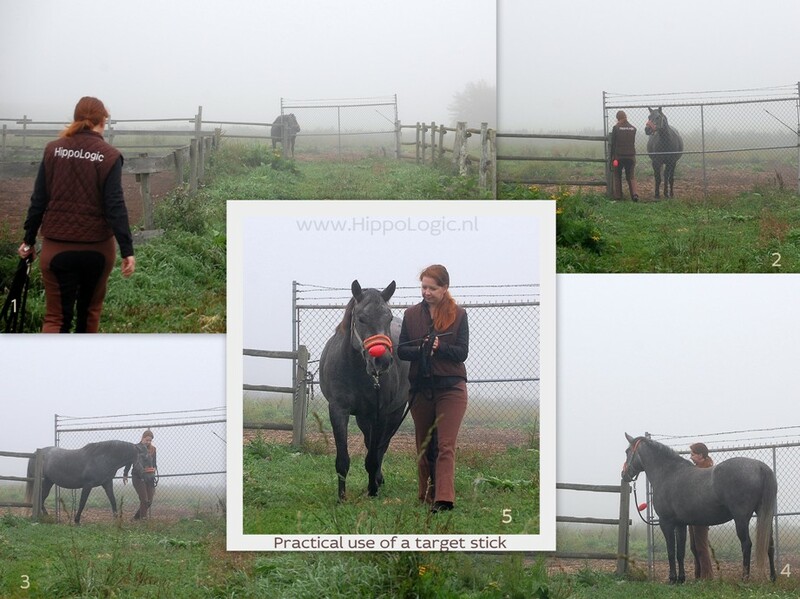 We know how to do it: influencing the context in which the horse learns a new skill, keeping the sessions short, splitting your goal into small training steps and be aware of our reward schedule. But what can we do to help ourselves to be successful? You only know if you have succeeded if you know your own definition of success. This is very personal. Take the time to think about it for a minute: How do you define your ‘success’ in riding or training/keeping your horse? Just pause now and try to think of 5 things that define ‘success’ and write them down. For me setting a training goal and writing it down helps. Without this compass I feel lost. But achieving my goal isn’t the only measurement for success. For me ‘being successful in training’ involves other criteria. Here are two other pillars that define success for me. It is important to me that my horse enjoys the training, too. I want an attentive, eager and happy horse. If a horse shows resistance, fear, frustration, pain and/or signs of a mental shut down (learned helplessness) it doesn’t matter to me if I reach my desired goal. I was not successful as trainer. I want to succeed as a team, which means we both are enjoying spending time together. The journey is just as important as the destination. We all make mistakes, but it is not about the mistakes. It is all about how you handle ‘mistakes’. I never call them mistakes, I prefer to call them ‘points of learning’. As long as I have learned something new or found a new way to approach a ‘puzzle’ in my training I can feel good about myself. Sometimes we learn a lot more than we thought we would learn when we started. I don’t have to reach my training goal in order to feel successful in the process. In all the books I’ve read about how to become successful there is one tip that is always the same, no matter if it is about a career of becoming a top athlete. They all have their accountability partner. Someone who motivates you, keep you on track and listens to you when you encounter a ‘bump in the road’. In order to set yourself up for success, start with the basics. This means that you profit from other peoples learning points. Why invent the wheel again? It doesn’t matter if you are a novice or a seasoned clicker trainer: the basics are key to your success. This is why I like to call them Key lessons. You can find them in the category ‘Key lessons’ in the drop down menu on the right or when you follow this link. It is really nice to share your achievements with people who are happy for you. So find yourself a support team on the Internet or in real life. Don’t forget: you could be someone else’s inspiration! You don’t need other people to celebrate your goals. I have recorded my training successes, big and small, in many ways to enjoy them long after I have achieved them. I made videos and photo albums and I have written them down in my training logbooks. It helps me realize that I already am successful, even if I haven’t achieved my next goal. How do you set yourself up for success? Please let me know in the comments, I like to be inspired by fellow equestrians. Thank you. Would you like to know how you can accomplish your equestrian dreams and goals? It is quite simple really. These 5 steps will help you become successful. Aks yourself what it is you would like to do or achieve with your horse. Why did you buy your horse in the first place? What did you envision, what was your dream? Buy yourself a nice notebook and make a list with all the things that come to mind when you are thinking of your equestrian goals. Nothing is too crazy, just write it all down. No one is judging. Take the time to dream away andwrite down everything you can think off, that sounds appealing to do or achieve. Don’t forget all the little things that you want to do, too. OK, now you hopefully have a long list full of fun things to do with your horse. Next step is to make categories. Are your wishes realistic? Can your horse do it and could you do it? If it is not possible in the near future, it might be possible in a few years. Is it still something you would like to do? Is it fun, scary, dangerous? Is it a childhood dream or do you really still want to accomplish this? Are your old dreams still valid? Who’s goal is it? Is it really yours or maybe it is your parents vision for you and your horse? Maybe it is something your instructor wants you to do or maybe it is something ‘everyone should be doing with their horse’, like riding. Write down which resources or circumstances you need to achieve it. For instance if hacking out is your goal, you can write down: reliable horse, owning a trailer and pick up truck or a boarding facility near trails or someone you can hire to transport your horse. And so on. This helps you to visualize what things you have to change or what resources are there and you are not using. Now that you’ve figured out what you want and what you can, it is time to make a training plan. A big goal can dis-encourage you, so divide it into many small steps. If you want to trail ride, your training plan might contain steps like: be able to ride my horse in all gaits, horse must stand still reliably, horse stands patiently next to a mounting block, horse loads easily into a trailer, horse is bomb-proof and so on. If you want to make it really easy for yourself, make shaping plans as well. Think about how you would train your horse to turn him into an easy loader. This is your shaping plan. Make the steps so small that they almost look too easy to even think about it. A shaping plan for trailer loading contains many steps, from ‘horse looks at the trailer’ to the end goal where he loads and unloads easily everywhere and is happy to be on the road. Now you’ve made your training plan and shaping plans keep them in a visible place like your tack locker or your bathroom mirror. Somewhere you see it often so it motivates you to keep going. If writing a training plan and/or shaping plans seem too much trouble for you at this point, then keep it simple. Start easy and just hang a list of your goals in your tack locker. Writing things down will make you more focused. Try it. Write it down and planning it, is sometimes not enough. Share your goals with friends or family! Don’t keep them for your self. The best thing to do is share them with your accountability partner. All successful athletes and business people have an accountability partner. Why not you? Find one today! In part 1 of this trilogy I talked about how my vision and use of ‘timing’ and taking emotions into consideration changed the way I train. In part 2 I mentioned how I changed the way I use rewards now. There is another tool I now use completely different. It is my training journal. Before my reward-based training journey began I already wrote about my training. It started like a diary: I wrote down the things I did with my pony that day and I wrote down (preventive) medical treatments like deworming, hoof trims and so on. I still have those journals, and it is nice to reread them. Unfortunately it doesn’t give me any useful information, years later. Now I write my plans for the future, the training plans and I about how the training went in my training journal. If I reread those entries, I can see what my ambitions were, how I approached them and what I achieved. If I read back in my training plan I know which steps I took to achieve my end behaviour and in my journal I can read all about my learning points and what went well. I also have an idea now how long it took me to teach the behaviour. 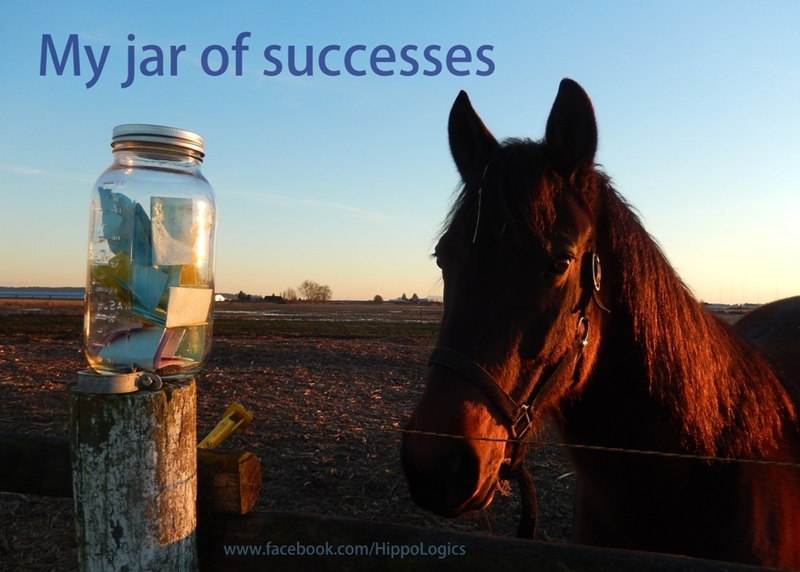 It is also a great reminder what I already have accomplished together with my horse. One really quickly tends to forget about these things and it is temping to only focus on what you ‘still have to accomplish’. One of the things I did the first year was to make pictures of all my achieved goals and put them in a lovely photo album. Every month one or two goals or milestones. It is a nice reminder of all we have done. Writing makes things clear. I noticed that if I write my goals down, it is already easier to achieve them. By writing them down, they become clear in your subconscious. If I have a list of goals in my tack locker which I can see every day, it is much easier to make choices about what to train. Even if I change my original plan for the day, I will most likely choose something that is a stepping stone to another behaviour I want to work on in the future. Do you write your plans down? Do you think it is helpful? Is it hard for you? If you don’t know where to start, find yourself an accountability partner. If you scroll to the topics on my blog you might have noticed that I am writing a lot about planning and journaling. The reason is, that it helps me a lot in training my horse efficiently and therefor I reach my goals. Which I like! Often I reach them even sooner than I expect and that works very motivating. I wish that every passionate horse enthusiast can achieve their equestrian dreams. It’s such an awesome feeling to tick of a goal off your list and reread your journal or look at your photo’s. When I just got Kyra, I made a detailed plan to tame her. My long term goals were: I wanted a horse that I could ride in demos, a horse that would be comfortable with music, could do trick training and could show people expert exercises of the classical dressage. Kyra was really wild and really scared about anything and everything was new when I got her. She was born in a nature reserve and she was just several weeks before she was separated from her mom and her herd. It must have been a very stressful time in her life: losing the two things she relied on for her survival. Kyra was 10 months old and nothing she saw around her was familiar: tractors, people, running children, peacocks, dogs, cows and calves, a stall, radio and so on. Everything scared her, she was stressed about everything. It was sad to see her so frightened all the time. I wondered if she could be tamed at all. I never saw a horse in so much distress. I could feed her from my hand but it had to be through the bars of her stall and only if I didn’t make eye contact. As soon as I opened the door, that behaviour was gone! I started thinking about a training plan. If I wanted to halter her I had to be able to approach her. If I wanted to approach her, I would like her to face me instead of trying to run from me and trying to climb the walls in her stall or threatening to kick me. I thought about safety, too. She was in a stall but I didn’t want her to get out before I could approach and halter her. I also didn’t want to get kicked, since I was pregnant at the time. My list helped me to make a training plan. The plan kept me on track and helped me set a logical order to do things. 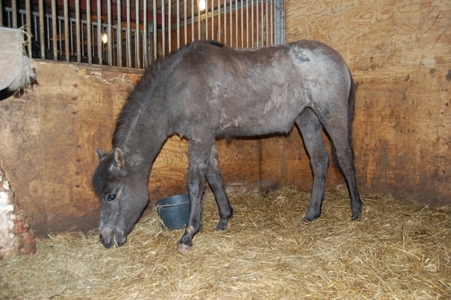 Taming a wild filly was my biggest challenge until then. I had started horses under saddle before. I had known my first pony since the day he was born and I had taught him all kinds of husbandry skills, groundwork and had started him under saddle. That was different because we grew up together. Kyra was born in a nature reserve in The Netherlands. This was a new challenge and it felt like a big adventure in which the assignment was ‘tame a wild filly’. That is why I decided to keep a training diary. Wouldn’t it be awesome if I could recall how long it took me and what difficulties I would encounter? I thought it might take me a year or so. I started this adventure very open minded and I took it day by day. Every day I wrote my results down in my training journal. I made pictures of my achieved goals. Writing about my experiences kept me going. It was so motivating to read about what we achieved in such a short time. I got hooked on journaling. It only took me three weeks to tame Kyra, read here what she was able to after 23 training sessions. I never stopped making plans for Kyra and I never stopped keeping some kind of logbook. Sometimes I write detailed reports about our training, sometimes I just make a video or a photo of our achieved goal. I found an accountability partner and we made detailed plans for our green horses to prepare our horses on the ground for their future under saddle. We started making future plans which contained our ultimate equestrian dreams and distilled our 10 year plan, our 5 year plan, our year plan and 12 month goals from it. Every month we got together and showed each other our achievements, talked about the problems we encountered and helped each other with a listening ear and sometimes with advice. I started a Facebook group Happy Herd. Join us if you need an accountability partner. My blog is called Making Equestrian Dreams come true. Fast forward 6 years. I now live in Canada. I brought Kyra with me. She is under saddle now (prepared her with +R only), participated in Horse Agility competitions, an online clicker training competition and I made a few trail rides in the Canadian wilderness. I have plans to ride her without tack more frequently (watch the video on my YouTube channel). I have made a lot of my dreams come true. What are your dreams? How do you accomplish them? Sign up for my online 4 week course ‘Set Your Equestrian Goals and Achieve them‘ and I will teach you how to set your goals, make a planning, how to stay motivated and celebrate your successes!